I've been searching for a pair of comfortable pants that can transition from heels to flats (or even sneakers) and I found them! Fabrizio-Gianni asked me to test drive their techno stretch cropped pant and I'm in love. This is a pull on (elastic waist) pant, but make no mistake...it's totally modern and oh so comfortable ! The techno pant is one of the most versatile pieces you can own. The ankle length is fabulous and the fabric is just amazing. The cut is slim, but not super skinny, making it a great style for most body types. 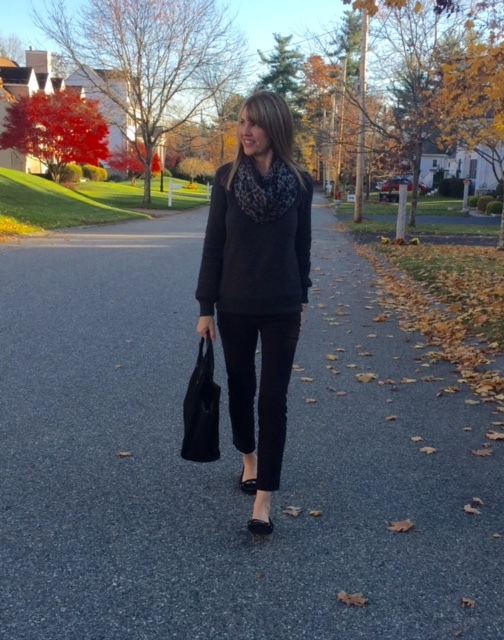 The techno pant is season-less and the no-wrinkle fabric makes them perfect for traveling! What more could you ask for? 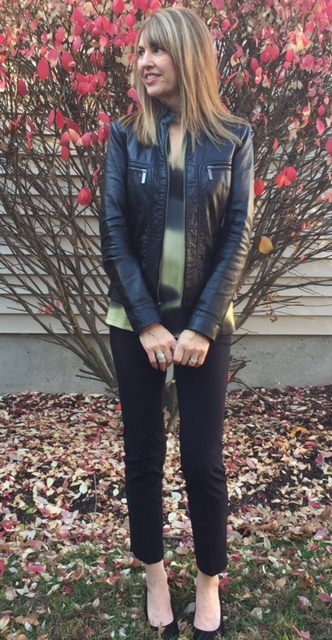 I've paired the techno pant with Fabrizio-Gianni's gorgeous jersey knit 3/4 sleeve tee. I adore the colors and the fit is is spot on (no cling!). 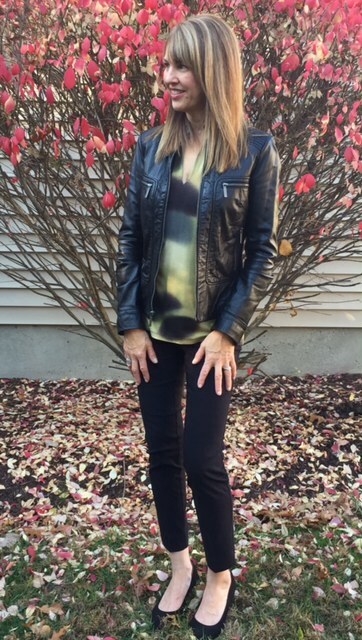 I topped things off with my Michael Kors leather jacket (wardrobe staple) and incredibly comfy Trotters suede pumps, which you can't really see since there are so many leaves on my lawn--time to rake! If the pant fits, wear it...and I intend to wear this pair often! Get 15% off with code fabgsk15. The pants sound great! The tee is gorgeous, too! Does it only come in cropped? Where can I try one on? Hi Mira! They come in other styles too. I love the line...quality and made in the U.S. Now that's a concept!